Previously, I mentioned that I gave the opening keynote presentation at the final annual conference on Rural Prosperity in Canada, held at Queen’s University of Kingston, Ontario. Norm Jacknis provided an inspiring presentation at our 6th annual rural economic development conference. He helped a group of community leaders, business people, policymakers and researchers consider new opportunities for rural prosperity and to think creatively about how they can use technology to transform their economies. You can see the printed handout at http://business.queensu.ca/centres/monieson/events/Economic_Revitalization_2014/Presentations/2014%20conference%20presentations/Norm%20Jacknis.pdf Of course, if you only read the handout, you’ll miss the videos and also what I say about each slide since I don’t really read them. I’ve been asked about books I’ve written part of or have a relationship to. Since we’re in the relative quiet time of summer, I’m using this post to respond. First, before this year, I wrote a chapter on “A New Kind Of Public Square For Urban America: How Sub-National Government Will Be Impacted In A Hybrid Physical-Virtual World Of Ubiquitous Communications”. 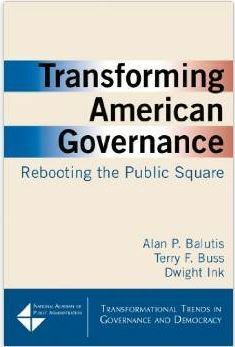 It appears in Transforming American Governance: Rebooting the Public Square (Transformational Trends in Governance and Democracy) . 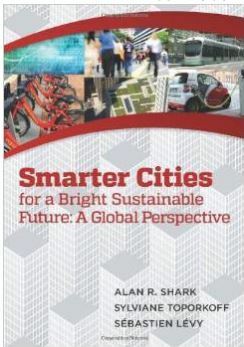 More recently published, in March 2014, was the compilation of essays, titled Smart Cities for a Bright Sustainable Future – A Global Perspective . The chapter I wrote focuses on “Beyond Smarter City Infrastructure – The New Urban Experience”. 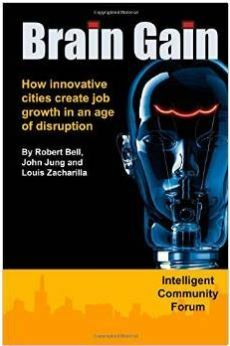 As Senior Fellow at the Intelligent Community Forum, I’m also pleased to see the three co-founders of ICF write a new book in April 2014, titled Brain Gain: How innovative cities create job growth in an age of disruption . You can learn more about the book and the ideas in it at www.BrainGainBook.com . Obviously, these books have a focus on big urban centers. But they have implications for smaller communities as well. For a flavor of that, you might want to register for Public Sector Digest’s webinar on “Small Communities, Intelligent Communities”. It will be held today, July 23, 2014 from 1:00 PM EDT to 2:00 PM EDT. Online Collaboration Upending Old Ways? This post is about some of the more interesting and unusual news items that provide continuing evidence of the way that online collaboration is upending old ways of doing things in several domains. We Feel is a project that explores whether social media—specifically Twitter—can provide an accurate, real-time signal of the world’s emotional state. Hundreds of millions of tweets are posted every day. … We Feel is about tapping that signal to better understand the prevalence and drivers of emotions. We hope it can uncover, for example, where people are most at risk of depression and how the mood and emotions of an area/region fluctuate over time. It could also help understand questions such as how strongly our emotions depend on social, economic and environmental factors such as the weather, time of day, day of the week, news of a major disaster or a downturn in the economy. Another domain which has more obviously been dominated by experts is medicine. While many hospitals and physicians are still working out their systems for electronic health records and billing in a changed insurance environment, patients are not waiting. Nor are various businesses – as we are already seeing an onslaught of wearable devices to help people track health from both large established companies and startups. Health systems across the world are under increasing pressure. The demands are rising, but resources often can’t keep pace. One way to help relieve the pressure is for people to engage more in their own health. Taking greater control, ownership and responsibility for keeping well. [uMotif offers] Software for health self-management and shared decision making, supporting patients and clinicians; strengthening relationships; improving healthcare. And then there’s the Longitude Prize, which was created in the 18th century by the British government. The winner had to create a workable way to determine a ship’s longitude. In a sequel to that original prize, there is now in the UK a new Longitude Prize 2014. 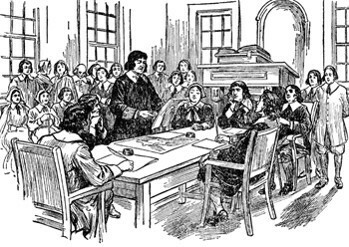 But instead of an official body determining the topic, this being the 21st century, the Longitude Committee used crowdsourcing and asked the public to submit ideas. The public’s choice of a new challenge? “In order to tackle growing levels of antimicrobial resistance, the challenge set for the Longitude Prize is to create a cost-effective, accurate, rapid and easy-to-use test for bacterial infections that will allow health professionals worldwide to administer the right antibiotics at the right time. Now that the antibiotics challenge has been chosen, we want everyone, from amateur scientists to the professional scientific community, to try and solve it. Nesta [the National Endowment for Science Technology and the Arts in the UK] and the Longitude Committee are finalising the criteria for how to win the £10 million prize, and from the autumn you will be able to submit your entries. I’ve previously described the success that Zooniverse has had in amateur science, but the Longitude Committee has upped the ante considerably by offering such a large prize. Good luck to all my readers! It’s summer and time to catch up on some interesting tech news. This post is about robots going beyond their use in warehouses, factories or even as personal assistants – indeed, it’s about robots outdoors. You can find out more at http://sydney.edu.au/news/84.html?newscategoryid=2&newsstoryid=13686, which also lets you know that its developer, University of Sydney robotics Professor Salah Sukkarieh, was named last month as the "Researcher of the Year” by the Australian Vegetable Industry association. From robots working hard in the fields, let’s go to robots having some fun on the road – HitchBot, which is the invention of two Canadian computer scientists. 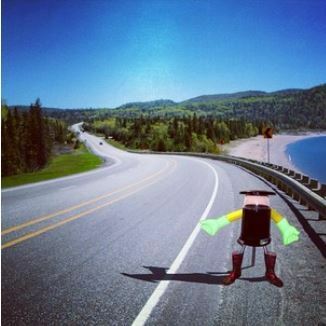 HitchBot plans to hitch rides across Canada this summer. “I am hitchBOT — a robot from Port Credit, Ontario. “This summer I will be traveling across Canada, from coast-to-coast. I am hoping to make new friends, have interesting conversations, and see new places along the way. As you may have guessed robots cannot get driver’s licenses yet, so I’ll be hitchhiking my entire way. I have been planning my trip with the help of my big family of researchers in Toronto. I will be making my way from the east coast to the west coast starting in July. Also from the end of last year, another drone was featured in a New Scientist article titled “Spider-drones weave high-rise structures out of cables”. This one was also developed in Switzerland at the Swiss Federal Institute of Technology (ETH) in Zurich. 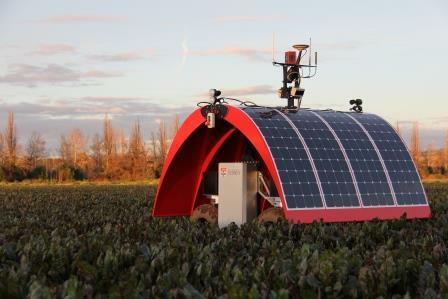 And these are just a few of the examples of robotics changing how we will get things done outdoors around the globe. Starting at the national level with the Obama Administration’s open government initiative in 2009, there have been many attempts at crowdsourcing in various governments and public agencies. From his campaign, President Obama realized that we can now scale up collaboration and participation – and create a 21st century version of the old New England Town Meetings that, while not perfect, did a pretty good job of engaging residents. Fewer people participated than expected. The site went stale, with early excitement evaporating and participation going to zero. As an example, see the Texas Red Tape Challenge. Citizens were encouraged to participate and did so, only to find that their ideas were disregarded by public officials, which only increased the frustration among both citizen and officials. Nevertheless, when they succeed, citizen engagements can satisfy several public purposes. They are a great way to get help and new ideas, test proposals, understand priorities of voters and educate citizens about the complexities and realities of governing. Moreover, in response to the general decline in respect for major public, nonprofit and private institutions, crowdsourcing is a way of earning back respect and trust – and convincing a skeptical public that public officials really care. All of these benefits make it easier for public officials to govern better. And the successes have provided important lessons. Most important, like lots of other things, crowdsourcing requires some thought before implementation. End the engagement in a way that provides a positive experience for citizens and the government. When these engagements actually engage citizens, they help redefine the relationship between public officials and the people they serve. And they can provide a core of solid support from the public that any public official would desire – the kind of support that will carry officials through those bad times when they also make mistakes.